Kevin’s Mom, Renee, was here visiting for a 2 week stint before she made her way to Germany to visit Kevin’s sister. During Renee’s time here, we got to celebrate her birthday. Instead of getting her a gift that she’d have to lug around with her on her trip, Kevin and I made a batch of grain-free cupcakes topped with my fudge frosting. I think Renee worries that Kevin and I are missing out on all the fun stuff because of our gluten-free, dairy-free eating style. 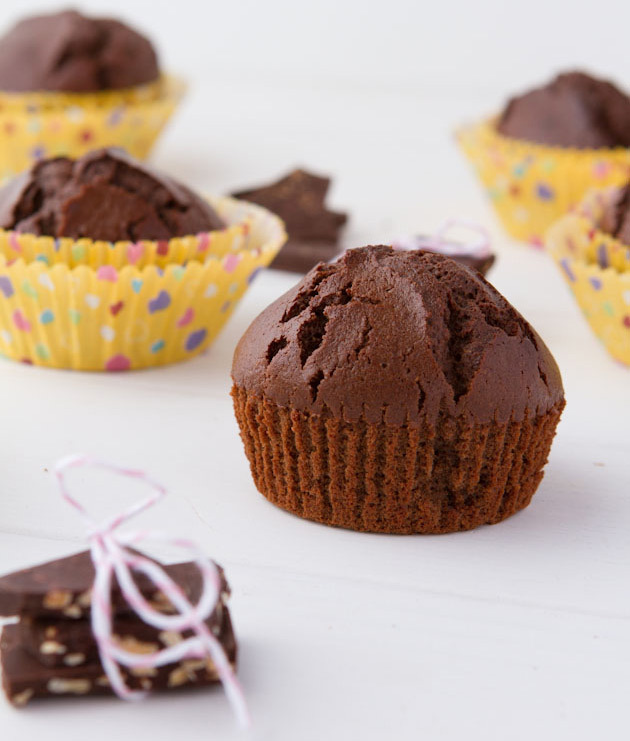 Making a batch of deliciously decadent cupcakes proves that us gluten-free, dairy-free, grain-free, nut-free folk aren’t missing out on any of the fun. And… she loved them! Even had them for breakfast each day following her birthday. With the frosting, the cupcakes were light, fluffy and fudge-packed. Without the frosting, the cupcakes totally passed as a muffin. 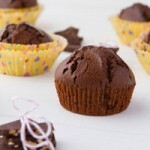 A gluten-free chocolate muffin under 200 calories and loaded with fiber. Sure they weren’t as fudgy without the frosting, but they were darn good! So today, I wanted to share the base of this delicious recipe with YOU. 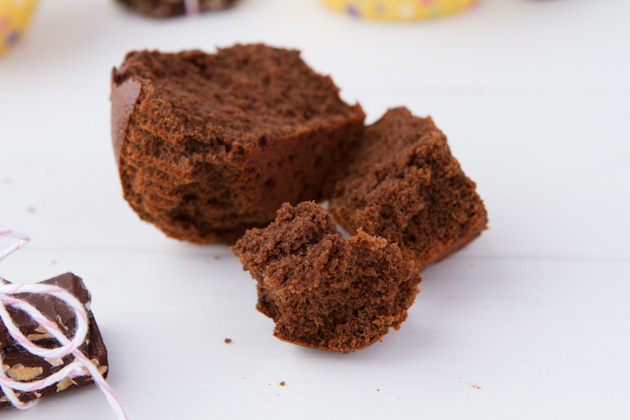 Either enjoy them on their own as a muffin (maybe add in some dairy-free chocolate chips) or top them with my fudge frosting and serve them up at your next birthday party! 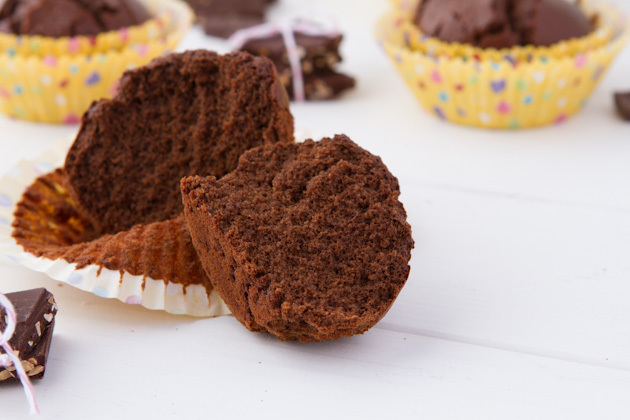 If you love chocolate, you're going to adore these gluten-free chocolate muffins. Rich, moist and chocolately, these muffins are a chocolate-lover's dream. 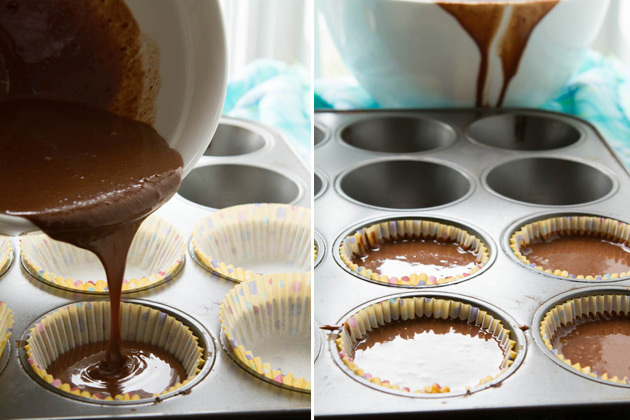 Preheat oven to 350F and line a 6-cup muffin tin with paper liners. Set aside. Add flour, sugar, cocoa powder, baking powder, baking soda and salt. Stir to mix thoroughly. Add wet ingredients; milk, egg white, oil and extract. Mix thoroughly, then add boiling water. Stir completely. Let sit for 1 minute, then pour into prepared paper liners. Bake in preheated oven for 23- 25 minutes, or until toothpick inserted comes out clean. I found that the toothpick held a bit of gumminess due to using chickpea flour but left to cool, they firmed up perfectly to the consistency of a real, gluten-packed muffin. Sugar - I used demerara sugar for this recipe. I'm sure you could use an equal amount of coconut sugar. Vegan and egg-free - I'm sure that you could try making this recipe vegan or egg-free by replacing the egg whites with 2 teaspoons of ground flax seed and 4 teaspoons of warm water. Let sit for 5 minutes, then use in recipe. I have not tested this, but it's where I would start. That, or an equal amount of apple sauce or banana puree. Baking soda and baking powder - if you are going to use conventional baking powder or baking soda (not the Ener-G brand), reduce the measurements by half than what it calls for in the recipe. I would love to read your stories. What you share will benefit thousands of women in our community. Let your light shine brightly! How do you manage friends or family members that don’t support or understand your eating style? Have you tried introducing your friends to new healthy ingredients by baking or cooking for them? What was the result?